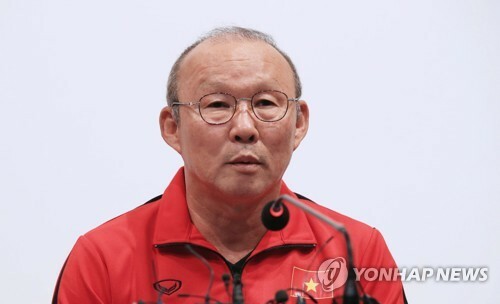 PAJU, South Korea, Oct. 18 (Yonhap) — Vietnam national football team head coach Park Hang-seo said Thursday he has yet to think about meeting his home country at the continental tournament next year. Park is a South Korean who earned national hero status in Vietnam after leading their national team to a runner-up finish at the Asian Football Confederation (AFC) U-23 Championship and to semifinals at the 18th Asian Games. Park was put in an awkward position at the Asian Games in August when Vietnam met South Korea in the semifinals. Park’s side then suffered a 3-1 defeat to eventual champions South Korea. South Korea and Vietnam are two of the 24 teams that will compete in the 2019 AFC Asian Cup, which will be staged in the United Arab Emirates from Jan. 5 to Feb. 1. South Korea are in Group C with China, Kyrgyzstan and the Philippines, while Vietnam are paired with Iran, Iraq and Yemen in Group D.
Park, who was an assistant coach for Guus Hiddink’s South Korea team that reached the 2002 FIFA World Cup semifinals, said he got a positive impression of the South Korean national football team under new head coach Paulo Bento. Since the Portuguese took the helm in August, South Korea have collected two wins and two draws. 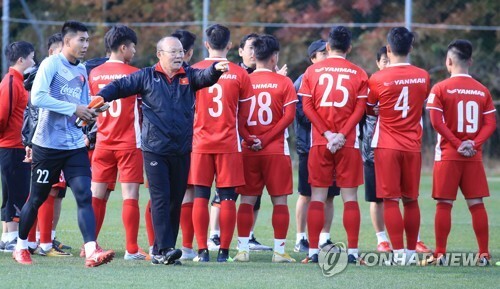 Park’s side have been training at the NFC in Paju since Wednesday to fine-tune their preparations for the ASEAN Football Federation (AFF) Championship, better known as the Suzuki Cup. The football tournament for Southeast Asian teams will be held from Nov. 8 to Dec. 15 in Thailand. Park’s Vietnam will stay at the NFC until the end of this month and will have friendly matches with South Korean pro football clubs.